Spending so much time in dealing with your cables and other accessories? You will not feel annoying anymore with this SYLPNOS travel electronic cable organizer for Ipad mini, Phone, Charger and Cable Organizer Cosmetic Bag ! 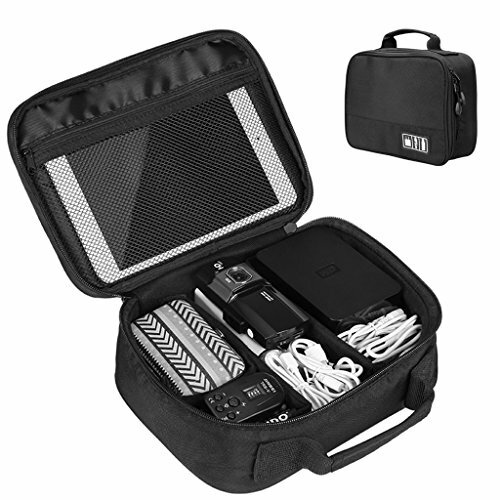 Made of heavy-duty, durable and waterproof nylon, it will protect your items from damage. 4 bags of different size are included to store your Ipad mini, phones, SD card, cables, power bank, mobile hard drive. You can also adjust the bag with dividers in the second section for various needs. Double zippers ensure easy and immediate access with your items. It can also be used as pen bags or cosmetic bags both at travel and home. Material: oxford fabric exterior; nylon fabric lining.